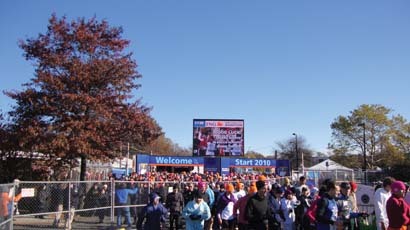 NEW YORK – Impact Video provided eight truck-mounted Daktronics LED video screens near the starting and finishing areas of the 2010 ING New York City Marathon. The truck-mounted LED displays ranged in size from 12×16 feet to 22×30 feet. Impact Video stationed five of the mobile units at the starting line at Fort Wadsworth on Staten Island, one of the five city boroughs along the route. Those displays were used for NBC's televised race coverage and international messaging and live camera production for the Open Zone entertainment area. The remaining three units displayed TV broadcast feeds to spectators gathered near the finish in Manhattan's Central Park, cheering on the 45,000 runners who entered the race. Along with HD LED technology, Impact Video's Illuminator Truck Mounted LED screens are well-suited to outdoor applications where there is no additional infrastructure available and limited setup time. The event, sponsored by the New York Road Runners, was also supported by more than 6,000 volunteers and seen by 2.5 million spectators. Graham Goetz, Coordinating Producer Multimedia & Entertainment for the event, credited Impact Video for a "total solution…from hardware to content to technical and artistic direction." Ethiopia's Gebre Gebremariam, won the marathon with a time of 2 hours, 8 minutes and 14 seconds. Other runners included Al Roker from the NBC Today Show, Robin Quivers of Howard Stern fame and rescued Chilean Miner Edison Pena.